An interior illustration for Draconomicon : Metallic Dragons book by D&D. I made lots of artworks for this title, so this would be a dragon month I guess Stay tuned! Seriously how do you make these pictures??? Is it digital or hand drawn??? Either way I would be impressed. Do you have any tutorials I can look at? your dragons are so cool! Do you have any tutorials? Your execution of detail is splendid. Always loved dragons, I don't know there just something about that draws you it! Love your works!!! This looks like Shardas and his brother-who I forget the name of. "This is MY peak! GET YOUR OWN!" 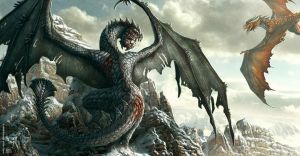 I am an admin for a faceook page about dragons, and I would like to share some of your amazing dragon art on it. The page is called The Dragonhood. If you allow me, I will give you full credit for the art and a link to your page. Thank you for your time, Flint. Great image! What dragon species are they? I know the one flying is a red dragon, but what is the other one? I am hoping to start my own work soon with dragons, would Photoshop CC work for something like this? I was just about to say the same thing about the dragon speices! yor details are crazy awesome! Wow !! D: ! I love it ! Wonderful detail. I love how you managed to make the dragon look rather tired and in pain (for good reason)... I could stare at this for hours. Good work! This is so fantabulous :3 Great job! Not to intrude. I am new. If someone is stealing your art or taking credit for it, shouldn't you do something about it? Or can you? Your work is being stolen and they are trying to take full credit for it. I admire how you have told this artist of the stealing and credit stuff. I hope This person is safe. That is awesome! Seriously! I love the scenery and the realism of the dragons. This has amazing graphics. Amazing work on this.